Calling all creatures great and small! You’re invited to bring your owners (sorry guys, you’ll have to be on a leash or in a cage most of the time) to the annual Ivy Chapel Blessing of the Animals. Please let your owners know that this year, we are partnering with SNUGGLE (Special Needs Under Gentle Guided Love Everyday). Visit SNUGGLE’s website to learn more. By wing or by tail, spread the word to all the critters you know! Join us here at Ivy Chapel United Church of Christ as we worship during Holy Week 2017. Immediately following Easter Sunrise Worship, there will be refreshments for all in Fellowship Hall. For more information about our Lenten worship services, get in touch with us. Help warm up our Chili Supper! 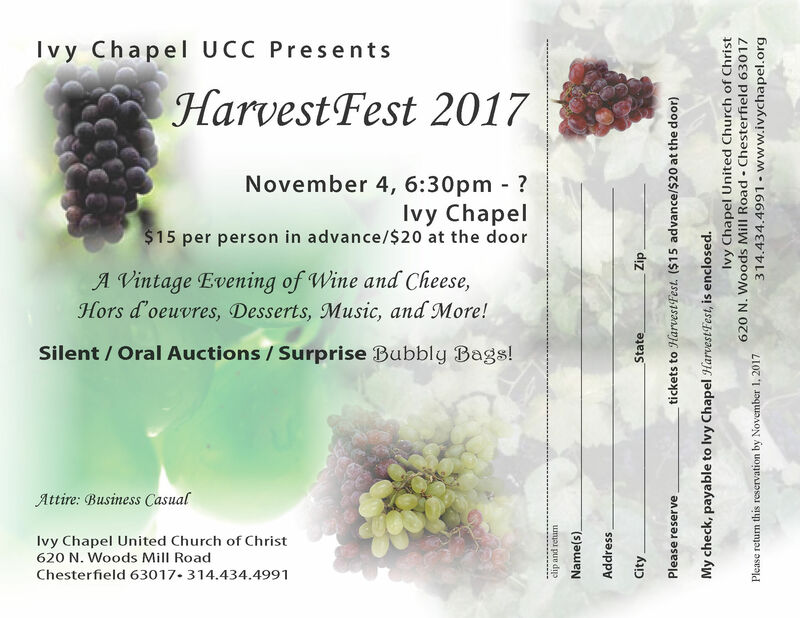 Can you help with the Ivy Chapel Chili Supper? We will need lots of volunteers to help on February 19 and 20 to set up, cook, serve and clean up. Sign-up sheets for those jobs will be in Fellowship Hall. This year there is going to be a raffle at the Chili Dinner. The committee would like to have about 10 or more items, donated by the congregation. A few examples might be Dierbergs gift cards, restaurant gift cards, homemade gift baskets, gift certificates for yard work, etc. We are also planning to serve homemade brownies and pies as dessert at the dinner on February 20th We need 10 batches of brownies, 9 by 13 pans. The brownies and pies need to be brought to church on Friday, February 19th. We are asking that the brownies be uncut, so they will stay fresher and can be cut uniformly. No icing please! Look for the sign-up sheets in fellowship hall. Sign up and share your favorite recipe. The Chili Dinner committee is asking for donations of cans of chili and beans and boxes or bags of crackers to place in the middle of the tables for decorations. After the February 1st dinner, these will be donated to the food pantries at Joint Neighborhood Ministries and Circle of Concern. Please bring them to church in the coming weeks and place them in the box in the Narthex. If you know of any way to help us offset any of the costs of food or supplies, or if you have any questions, please get in touch with us. If you’ve got answers… we’ve got questions. The family-friendly Ivy Chapel Trivia Night is on – March 12 from 6:30-8:30. (Doors open at 6 p.m. so you can decorate your table.) Tea, lemonade, popcorn and pretzels provided – but you can bring your own food or drink (beer, wine and soda) to keep your mind sharp throughout the night. It’s $12 per person – or $80 for tables of 8… plus a 50/50 raffle and a cash prize for being the know-it-all. Send us an email with questions or to reserve a table. You can RSVP on our Facebook page and let us know you’re coming. Be sure to share the event with your friends, too.